The “Third Week”: Week Twenty-Six/Session Two. Our reading for today: Philippians 2: 1-11. It’s commonly believed that Paul’s words to the Philippian church, found here in today’s text, are actually lyrics from one of the earliest hymns sung by followers of Christ in the first-century church. Verses six through eleven of Philippians 2 have commonly been called the Carmen Christi (Hymn to Christ), and theologians have argued for centuries over the authorship of these poetic words. Did Paul craft these verses about the essence of Christ as he sat down to write his friends in Philippi or was he quoting a well-known song lyric the early church was already singing by the time his letter was written? The question will most likely linger until Christ returns, and maybe then, we’ll discover the answer. But until then, I say, we forget about who first wrote these powerful words and let’s cherish the amazing depth of these verses, pondering on the truth found within. The hymn begins by establishing one of the most unshakeable tenets of the Christian faith: Jesus of Nazareth is equal to God. In fact, this statement, which was at the very core of Jesus’ Good News message, (“If you’ve seen me, you’ve seen God” John 14:9) is one of the primary reasons Jesus was crucified. 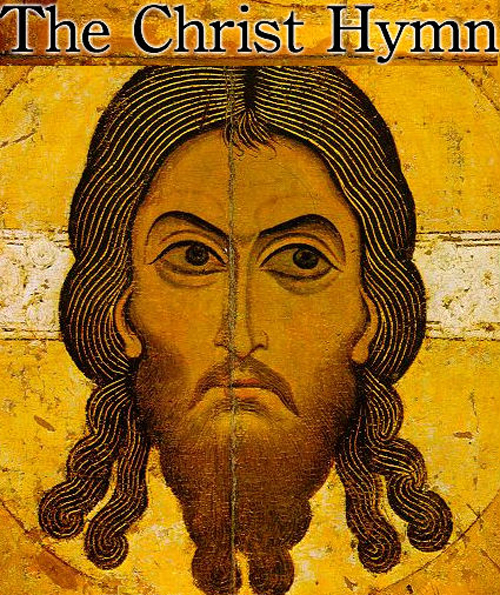 The hymn goes on to state that while Jesus was and is fully equal to God, or in other words, fully divine, He is also fully human, choosing continually to lay down His divinity, humbling Himself in ways that go far beyond any other divine object has or ever will, ever again. And as we discussed last time with the Pascal Mystery, it is this seemingly contradicting truth that Jesus is both fully divine and fully human that remains a mystery to our human understanding. But the hymn doesn’t stop there. It goes on to tell us that God, the Creator/King, is so pleased with His Son’s obedience in humbling Himself so that the Divine plan of redemption could be accomplished at the Cross, that God has bestowed upon Jesus the highest place of glory, honor, and power for all time. In other words, as Jesus chose, as a man, to become fully obedient to God’s desires, even unto death, that sacrificial obedience purchased for Christ the place of highest honor in the Kingdom of God. And its’ that throne of highest honor on which God’s Only Begotten Son sits today. If you’ve gotten anything at all out of following Christ, if His love has made any difference in your life, if being in a community of the Spirit means anything to you, if you have a heart, if you care— then do me a favor: Agree with each other, love each other, be deep-spirited friends. Don’t push your way to the front; don’t sweet-talk your way to the top. Put yourself aside, and help others get ahead. Don’t be obsessed with getting your own advantage. Forget yourselves long enough to lend a helping hand. Think of yourselves the way Christ Jesus thought of Himself. Hmm. Now the rubber is really meeting the road! Apparently, Paul was suggesting to his friends in Philippi that Christians (Christ-followers) not only sing about the amazing obedience of Christ, but we imitate His actions as well. My prayer: Father God, never let me become content with just singing about Jesus and His amazing obedience upon the Cross, but Holy Spirit, indwell and empower me to act in similar ways. For Your name’s sake. Amen. My questions to ponder: Where in my life do I need to become fully obedient to the will of the Father, humbling myself even to the point of personal loss so that I follow in the footsteps of the Master? Am I willing to live a life of such radical obedience, knowing that this is the commission of Christ, and indeed the place of glory for all who desire to follow Him in this world? This entry was posted in Our Ignatian Prayer Adventure and tagged Carmen Christi, Christ Jesus, Jesus, Jesus Christ by The Contemplative Activist. Bookmark the permalink.